Heathers is like The Room; an awful film by any standard, but created with such fierce audacity that you are almost forced to love it anyway. Ryder, Slater, Doherty; this cast is one of the worst in movie history, and yet somehow they came together to create an uncompromising cult classic. This was director Michael Lehmann’s first stab at a feature film, he would go on to make certified clunkers Hudson Hawk, Airheads, My Giant, and 40 Days and 40 Nights, but somehow he created an 80s iconic that we still talk about today; go figure. The Heathers are a group of high school girls who basically run the show. As a unit, they are organized, goal-oriented, powerful, and popular, a pack of perfect specimens with (supposedly) perfect lives. Veronica is also a member of the Heathers, turning the trio into a foursome, but her addition to the clique is based mostly on money and family, not on actual interest. Veronica would like nothing more than to destroy the monster she has helped create, and she’s about to get her chance. A new kid in town, Jason Dean, immediately catches her eye, and then convinces her that she doesn’t need the Heathers to be happy. Actually, according to J.D., Veronica needs them to die in order to be happy, which is news to her. I don’t know how, but Heathers is both bitching and bitchy at the same time. It’s a pillar of 80s culture and film making, but it’s also terrible, a skit of a movie that, if it premiered today, we would call the worst thing since unsliced bread. Ryder is a terrible actress, Slater is only copying Jack Nicholson, and the three Heathers aren’t any better. It’s oddly violent, simply bizarre, and comes across as a sick joke that was somehow, for some reason, filmed. But at the same time, it’s also time capsule gold. The catchphrases, the clothes, the teenage angst; gift-wrapped for your enjoyment. Some of the lines will go down as among the most quotable of all time, while others sink to the floor in a puddle of their vomit. I’m not sure I’ve ever come across a movie that is more frenetic and straight up weird, nor do I quite know what to make of it. 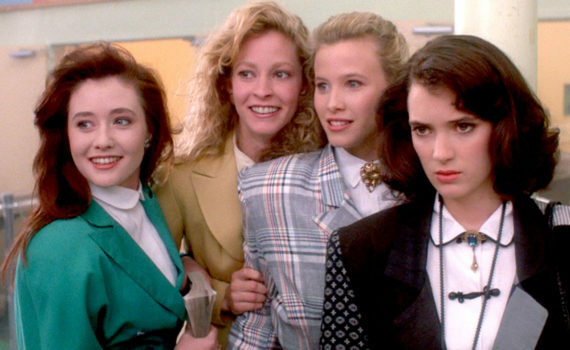 As an 80s fan, Heathers is “very”; as a film critic, it really, really isn’t.